When you speak of ketubah artists, there are a few names that might easily come up in the current of conversation. Maybe your friend really loves the modern designs of This Is Not A Ketubah. Or your bridesmaid has a Nava Shoham ketubah from her wedding that she swears by. However, not many ketubah conversations happen without mentioning Danny Azoulay. There is a reason for that. 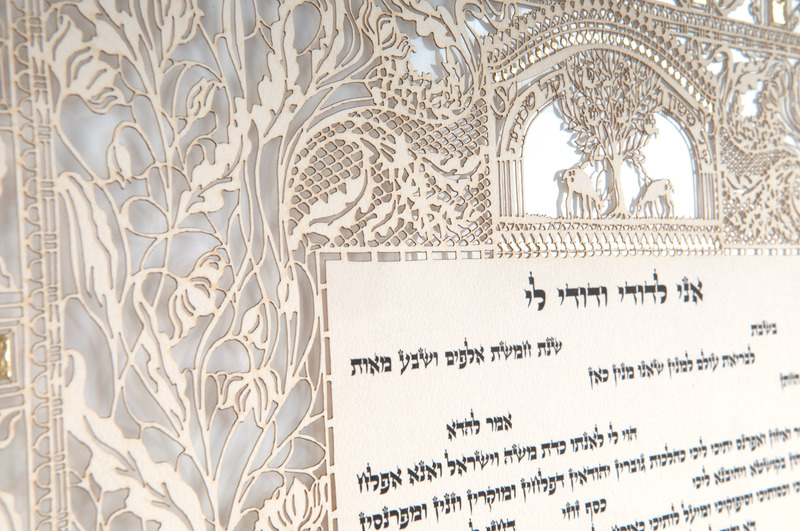 Danny Azoulay is one of the premier paper cutting artists within contemporary Judaica. All Danny Azoulay ketubot are printed by the giclee method – modern day lithography – cut by laser and hand-embellished with 24 karat gold leaf. Each ketubah is dated, numbered and signed by Danny and is one of a limited edition. When you see an Azoulay print up close, it is truly remarkable. It might even take your breath away (yes, really!). You can view the entire Danny Azoulay Ketubah Collection here. The Antique Lace Ketubah is unique for it’s added sense of dimensional depth. The genuine gold leaf quietly enhances the ornamentation, while the art work with its four-layer paper cut construction gives us a sense of three-dimensional depth. In other words, WOW! Another special print is the Birds Of Paradise Ketubah. The composition conveys movement and yet, a sense of a balance and calm.The charming palette of pastel pinks, blues and greens is enhanced by hand applied 24 karat gold leaf. If you are looking for a representation of artistic union between your fiancee and yourself, this is an amazing choice. The Jerusalem Gate Ketubah breathes a quiet life of its own. 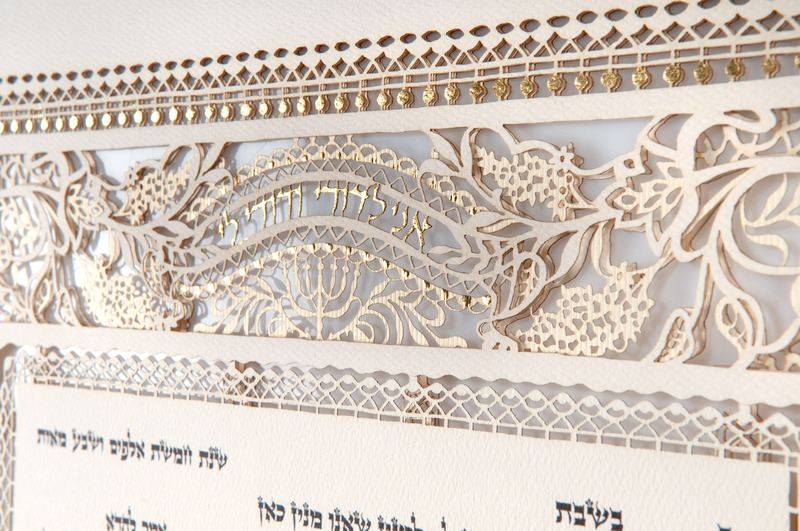 The intricate paper cut design, a hallmark of Azoulay’s ketubah designs, is breathtaking. 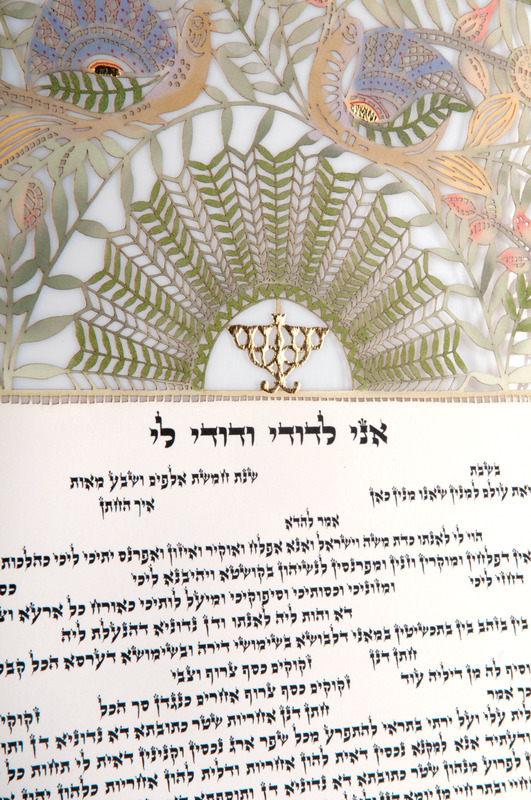 A dance of leaves and tendrils create patterns of loveliness and vitality through the top portion of the ketubah. There reigns an air of tranquility: a stolen moment of repose in life’s exhilarating journey. This is an eloquent allegory for the bride and groom and the oaths exchanged, which both binds and strengthens each one. A beautiful reminder that the bride and groom hold a safe place among one another. And to always to return there together throughout the storms of life. The Olive Ketubah by Danny Azoulay is comprised of five concentric circles of imagery, ornamentation and biblical texts that surround the ketubah text. The decorative innermost circle is embellished with 24-karat gold leaf. Up close you can see the radiance of the gold leaf decoration. Depending on its place in a room, the gold can reflect the light differently to add to the print. 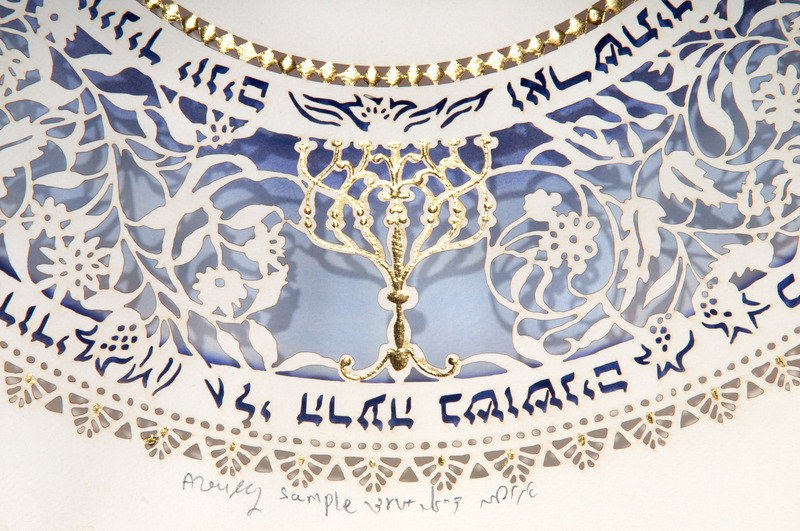 At first glance, investing in an Azoulay ketubah might seem like a lot of money. As most ketubahs by Azoulay start at $370 and above it is true that they are not a “budget ketubah”. If you are thinking of purchasing an Azoulay ketubah, but aren’t sure if it’s too much money to spend, be sure to talk it over with your fiancee. An Azoulay ketubah is the first family heirloom, a welcome sign of trust in the first home, and a piece of fine art that will be cherished for a lifetime. When put into perspective, it seems that it is money well spent for those who feel deeply connected to an Azoulay design.